The annually recurring problem for Christmas-concert presenters: Do you gently tweak the standard Holiday Classix and risk boredom among your more inquisitive types? Or do you bring in something completely novel, skirting the edge of that indefinable quality of “Christmassy”? The Bach Sinfonia, in its first holiday concert, probably had a little more room to operate than most, since people coming to the Sinfonia expect to hear something unfamiliar, or something they know in an unfamiliar way. Saturday’s concert offered both and, despite occasional hiccups, succeeded in both teaching a few things and celebrating the season. Conductor and artistic director Daniel Abraham told the audience that this was one of the few local concerts to emphasize instrumental Christmas music, and the Sinfonia delivered a sparkling performance of Arcangelo Corelli’s Op. 6 no. 8 concerto grosso, designated as a “Christmas concerto,” with textures clear in the small ensemble and vibrant rhythms driven by the indefatigable Douglas Poplin on violoncello. The performance of Giuseppe Torelli’s Op. 8 no. 6, with its ending pastorale specifically designated for Christmas, had the same virtues but also a few spectacular violin flubs. Most of the highlights came when Nola Richardson was singing. She has an agile, pretty soprano voice that worked extremely well in Bach’s challenging cantata “Jauchzet Gott in allen Landen.” Richardson confidently traversed its many, many, many runs while pronouncing all those unruly German diphthongs and remembering/managing to ornament the repeats. In the slower aria, with a chance to catch her breath, her voice really shone, with just a little vibrato and expressive tone that captured the anticipation of Advent effectively. 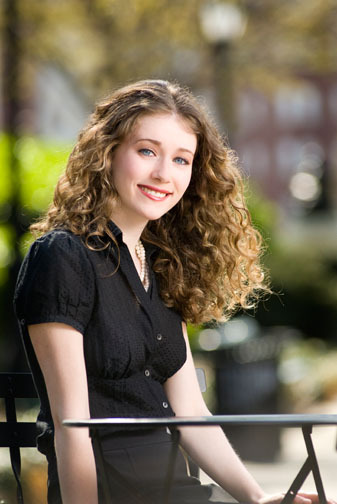 Photo of Nola Richardson from her website, taken by Joan Pedersen in 2009. Richardson also sang a wonderful “Let the bright seraphim” from Handel’s “Samson,” with trumpeter Stanley Curtis proving a more effective foil here than he did in the cantata. The “Domine Deus” from Vivaldi’s “Gloria” was an unexpected repertoire choice, but I’d listen to Richardson sing it in almost any context, and the music tied into Abraham’s theme of Christmas as expressed through the pastorale. The “Pifa” pastorale from Handel’s “Messiah” accomplished the triple win of fitting in with the rest of the program, actually being from the Christmas part of that seldom-heard oratorio, and allowing us to hear Richardson sing a really brisk “Rejoice greatly,” which was a good idea. Richardson was also by far the best singer during the audience sing-alongs. Lacking in significant familial duties and needing pocket money, I reviewed an absolute ton of holiday concerts during my time at the Post, and the single most challenging sing-along in which I have ever participated was on Saturday: Trying to navigate the original rhythm of the “Coventry Carol,” which apparently mixed and matched duple and triple rhythms within the bars of the refrain. It was kind of bewildering, but also strange and beautiful, and I learned something new about the carol while still being plunged into the Christmas spirit. You are currently browsing the DMV Classical weblog archives for December 2013.